If you have managed a team for any length of time, you are probably well aware of the challenges involved in fostering a teamwork culture. If everyone is not on the same page, getting them to perform like a well-oiled machine is more than just a little tricky. The good news is, one of the most effective ways to encourage your team to work more closely is to encourage social bonds in the workplace. Getting your team together for a midday meal is one of the easiest ways to get them to start talking and feeling comfortable around each other. Unlike most workplace situations, a team lunch allows everyone to get to know one another in a more relaxed context. Even if you are someone who prefers to keep to themselves, you will find work is much more enjoyable when you have positive relationships with your colleagues. 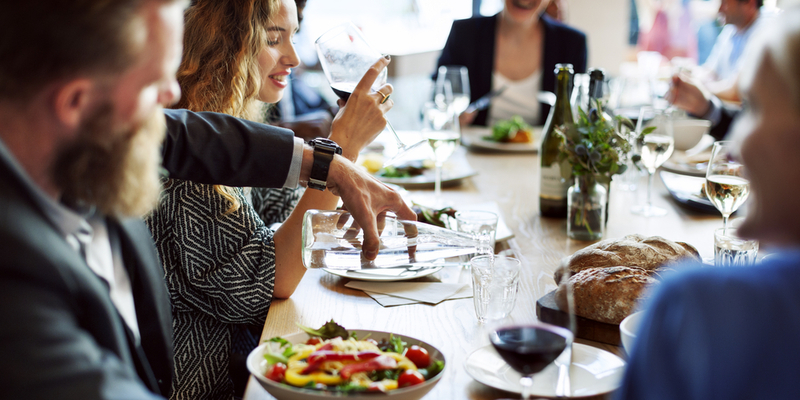 A team lunch can be a great way facilitate interactions outside of the office environment, giving everyone the chance to talk more freely and get to know their colleagues on a more personal level. Sure, it might be a little uncomfortable at first if you don’t know anyone—but you’ll quickly see that over time you can build closer relationships and even make friends. Not everyone can go out for drinks on a Friday, and some people balk at the idea of spending an entire day doing team building activities. While these things are great for boosting office morale every so often, a team lunch is both simple to organise and effective in getting your team to bond without making them feel as though they have to eschew other commitments. Research has shown that positive interpersonal connections result in better individual and work-related outcomes. This could be due to the fact that as humans, we have a strong desire to belong, and our sense of belonging can greatly influence how we feel about ourselves and our work. Positive relationships can make us happier, thus more productive. Besides, who doesn’t feel a million times better after a chatty lunch session with their work bestie? The importance of taking a break at work can’t be overstated—in fact, a recent U.S survey found that just over 50% of American workers say it is “rare or unrealistic to take a lunch break away from work”. This is likely due to the mistaken belief that being in front of the computer longer means you will get more work done. However, the survey also seemed to suggest that those who opt to step away from their desks for lunch feel better for doing so. Over half (51%) of office workers said they “feel refreshed” after taking a proper lunch break. It is much easier to convince your team to take a break if they all go out to lunch together—and having that hour to switch off and reconnect with your colleagues is much more beneficial for productivity in the long-term. Everyone wants to work for a company that respects them and their input. Now more than ever, employees are rating company culture as extremely important when evaluating a position. People want to feel good about coming to work, and feeling as though they are part of a team is one of the best ways to make that happen. The expense of losing employees can greatly affect any business, which is why keeping your employees happy is key to making them stay. If you cringe at the thought of networking, you’re not alone. Networking is still considered to be one of the biggest challenges among professionals. But did you know that one of the best places to network isn’t some fancy networking conference - it’s actually at work. The relationships we build throughout our career can help us in the future, both professionally and personally. By having lunch with your team, you can get to know them beyond their role and potentially form a strong connection that lasts long after you move on to different roles. The concept of “it’s not what you know, it’s who you know”, is still as true as ever, especially in smaller industries where everyone wants to hire someone they know and trust. Want to learn more about effective team management? Upskilled offer courses in Human Resources and Management to help you gain necessary qualifications as a Team Leader or Human Resources Manager. Courses like the Diploma of Human Resources Management (BSB50618) or the Diploma of Leadership and Management (BSB51918) can equip you with the skills to pursue leadership and management roles in your industry. If you want to learn more about where these qualifications can take you, be sure to check out our Career Section for more resources, advice and insights.